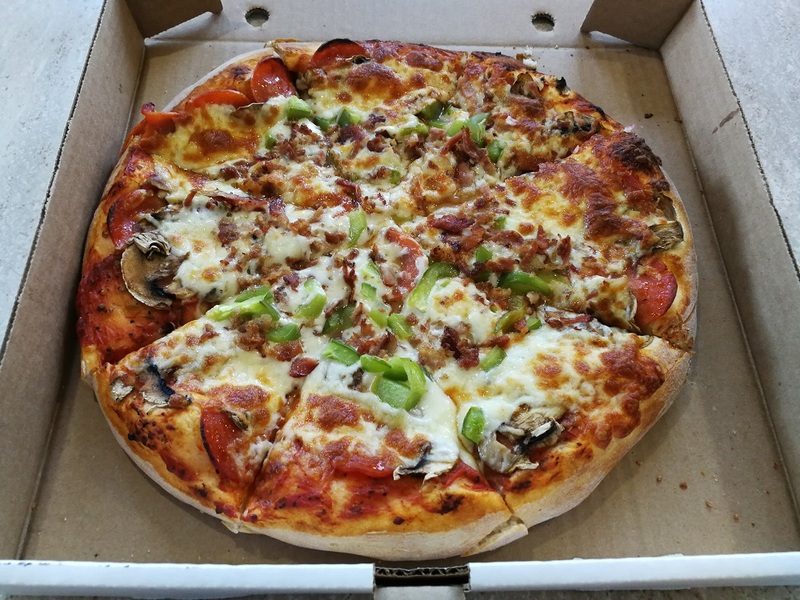 Outer Sackville Pizza Quest: Where is the best pizza in Sackville? The Halifax Pizza Quest has conquered all of Halifax & Dartmouth (including Clayton Park, Fairview and Spryfield) and now we have eaten our way through Sackville. You may remember our disappointing Lower Sackville Pizza Quest late last year, and I’m happy to say that Middle Sackville was much more satisfying. 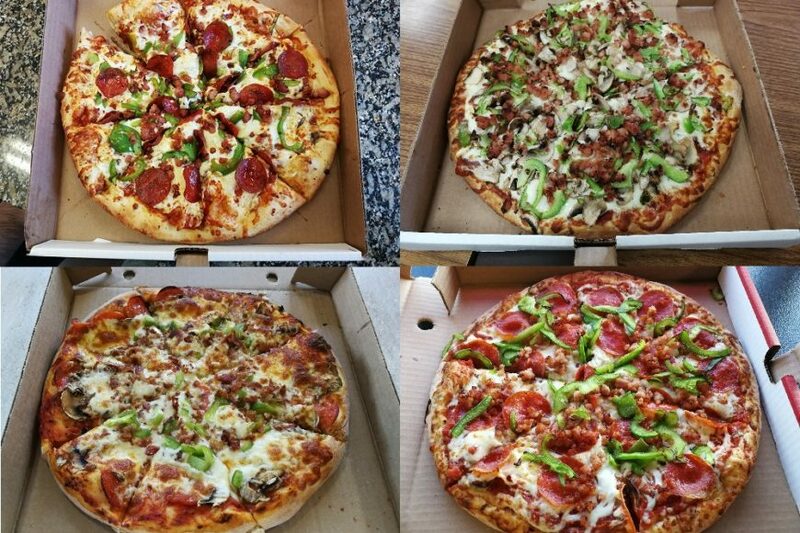 All of these pizzas are better than any Lower Sackville pizza. Due to the rural nature of this area, we didn’t convene in a centralized house but drove to each pizza shop to eat-in. We ordered a medium pizza with pepperoni, green pepper, mushroom and bacon at each stop. As we drove out to Mount Uniacke and saw the “Welcome to East Hants” sign, we realized we may have made a mistake. Who knew Mount Uniacke wasn’t part of the HRM? Not us! But we had come this far, so we can throw that technicality aside. Originally we were going to do the Pizzadelic in Mount Uniacke, but decided to reign the quest back in to the HRM. We had previously skipped over Pizzadelic on the Lower Sackville Pizza Quest so it seems crucial to include it now. We were delighted to find out that Cook’s Pizza doubles as a convenience store with actual seating. We wouldn’t have to eat off the hood of a car, after all! Our pizza came out piping hot, oozing with hot gooey cheese and leaving a wake of grease stains in the box. The crust was very fresh and fluffy, but also a bit doughy in spots. Due to the heat and grease and cheese it was hard to pick up and eat. The top-side pepperoni was nicely toasted, but it seemed pre-sliced from a package and was also a bit sparse, as were the bacon balls. We did like the large slices of green pepper on top, but the mushrooms were negligible. We all felt there weren’t enough toppings. As for the sauce, it was tangy with a bit of herb. Or, if you ask LuShark it was “barbecue sauce” and if you ask ReTales it was “manufactured tomato”. Haddad’s Pizza is also located in a convenience store, much to the glee of Halifax ReTales who has a thing for gas station gastronomy. The service was actually pretty good too, thanks to the friendly cashier lady. Whereas Cook’s Pizza was a little skimpy on the toppings, this pizza was exploding with them! Bacon balls were flying everywhere! The top-side mushrooms and peppers were abundant and flavourful while the pepperoni was securely tucked under the cheese. Despite our varying preferences, we all appreciated the quality and layering of this pepperoni. Whereas Cook’s Pizza was soft and doughy, Haddad’s crust was nice and crispy on the bottom. I think it would have won best crust if it wasn’t for LuShark getting a random doughy piece. The sauce had a bit of spice but was pretty basic. I really enjoyed the interplay of sauce and crunchy crust, which was amplified by the flavourful toppings. 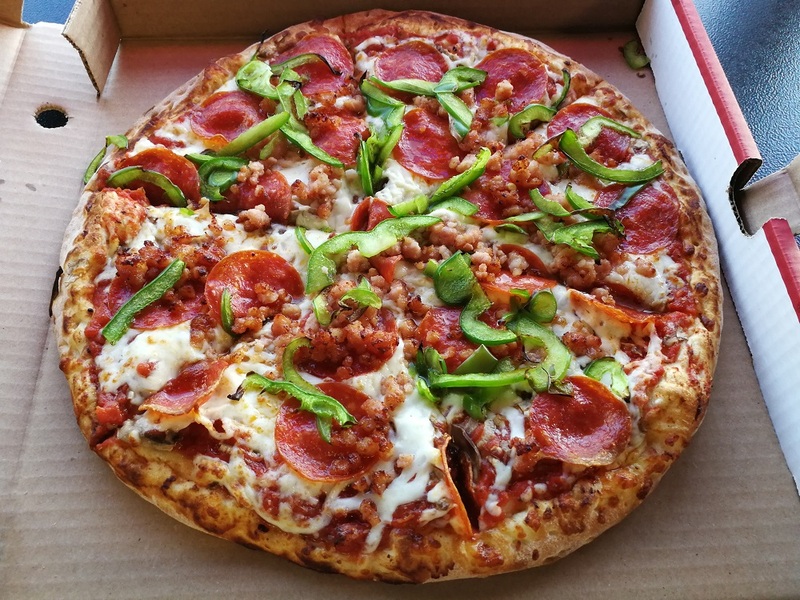 Haddad’s truly is an example of a pizza that is more than the sum of its parts. If you just look at the total combined scores for Crust, Sauce, Cheese & Toppings, Haddad’s scored the lowest. Yet somehow, it had the highest score for “Overall” and was pretty much everyone’s #1 or #2 pick. Whuuuuut?! I had to double check the math. But it’s true. “I think Haddad’s did everything right and I’d recommend them without hesitation.” – Denton. 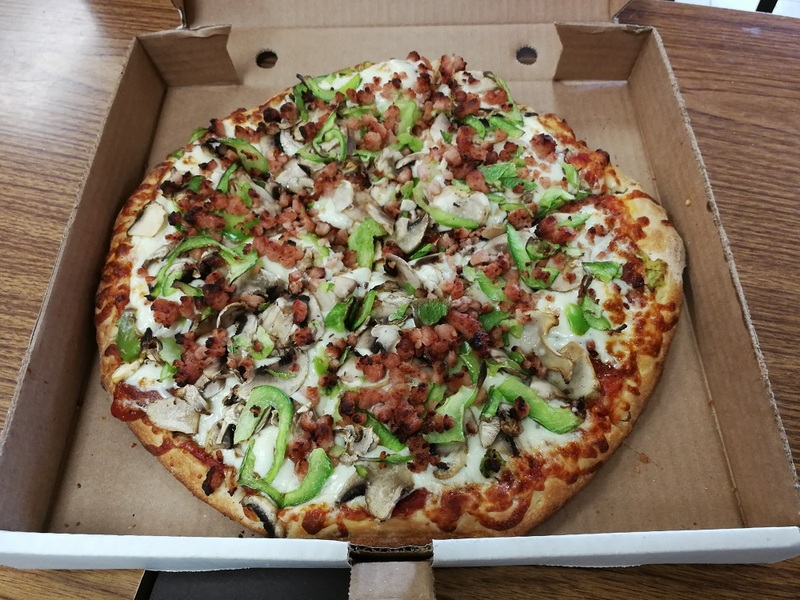 Mount Uniacke Pizza is actually a restaurant with ample seating, real plates, bottled beer and hand-cut fries. Goodbye convenience store dining! When the pizza arrived we could see greasy pools in the crevices and a golden brown hue – these are the telltale signs of real cheese! Real bacon was also featured, but it didn’t impart as much flavour as we would have liked. None of the toppings did. While Mount Uniacke got the highest score for cheese, it got the lowest score for toppings. The crust was adequate; it was crispy but nothing special. The sauce was a divisive topic. ReTales and Denton said they could not detect any sauce at all, only a sense of “moisture”. LA wrote that there was “lots of sauce” and I agree – I could see it oozing out of my slice. LuShark remarked that she could “taste herbs!” and LA thought she tasted a sweet spice like nutmeg or cinnamon. 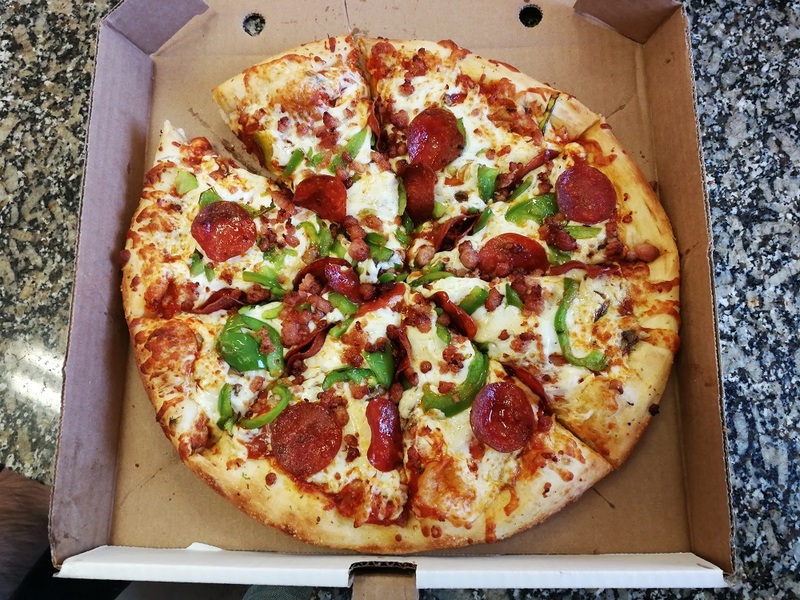 I thought it was a well balanced sauce, full of flavour, that grew on me bite after bite, bringing the whole pizza together. This was the #1 pick for LuShark, LA and myself whereas it was ReTales and Denton’s least favourite pizza of the day! Those who liked it were won over by the high quality cheese and flavourful sauce. LuShark described it as a good “pub pizza” and her happy dance at the table was telling. 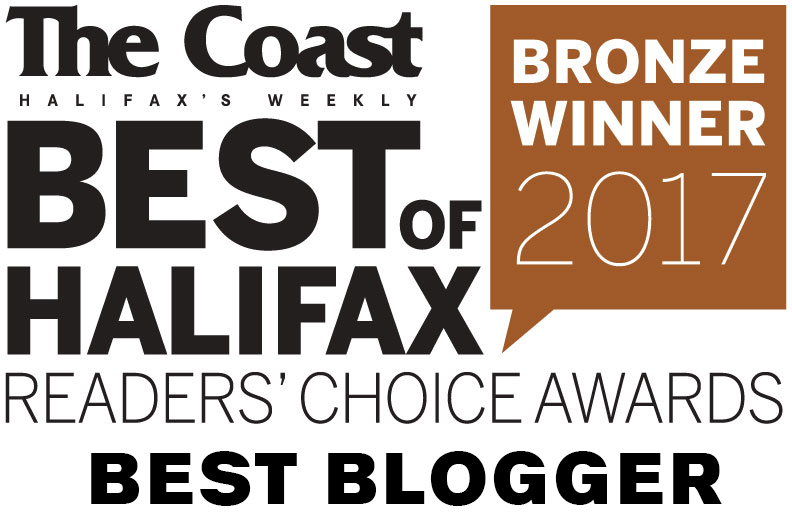 We covered Pizzadelic on the Clayton Park Quest, on which it scored 3rd place. I was eager to try it again, especially in another location. Well, this was much better than our Clayton Park experience (depending on who you ask but I think the photos say it all). This pizza had lots of bright, fresh toppings. We LOVED the dry cured pepperoni, the fresh mushrooms and green pepper. The sauce lent a zesty tomato punch to the overall package. The crust was pretty basic, but crispier than I remember it being on the CP quest. LuShark called this pizza a “Basic Bro” and “After-Bar Pizza” and I would tend to agree. Still, we enjoyed it quite a bit. Pizzadelic would have dominated the Lower Sackville pizza quest had we included it. We didn’t hate any of these pizzas, but we were pretty divided on Mount Uniacke with 3/5 of us loving it and 2/5 ranking it last. 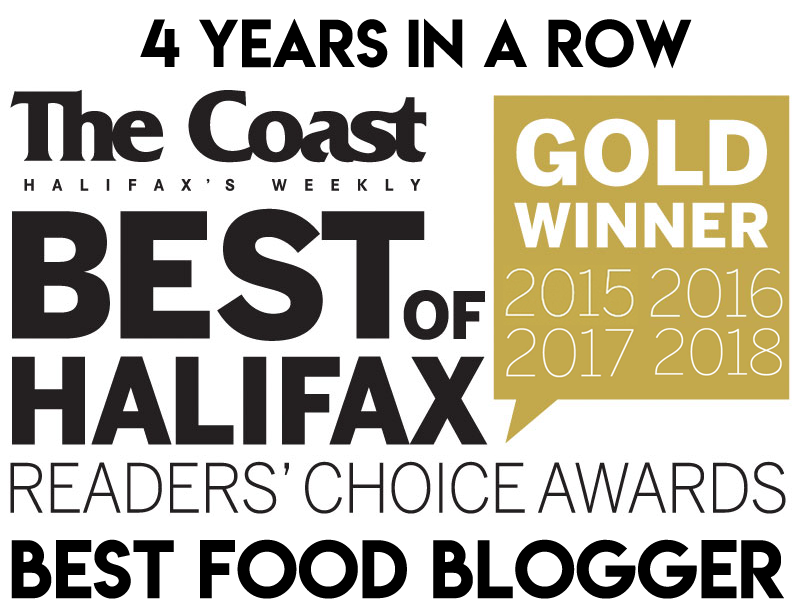 If we all had to agree on one place to eat, it would be Haddad’s (“Miss Congeniality”) but we wouldn’t make the trip to Middle Sackville to go there or anywhere. While not a destination pizza, Mount Uniacke is the only pizza I’ll still be thinking about after this quest and I would definitely return if I was in the area. Only Cook’s and Haddad’s were strictly in Middle Sackville and they were so close in terms of quality I would say it really depends on your preference. Haddad’s is crispy with plentiful toppings. Cook’s is cheesy & chewy with top-side pepperoni. They’re both good. Pizzadelic was certainly a surprise! I will have to amend the Lower Sackville Pizza Quest to attest to its merits. I think it would have had a really good chance at winning the #1 spot. Moral of the story is: pizza gets better the further you drive out of Lower Sackville! Another plus for Mt. Uniacke Pizza is that they deliver to the KOA campground. I know it may sound like glamping but when you get off work on a Friday, drag your camper and your family out to Upper Sackville then set up camp, the last thing you want to do is start cooking supper. Mt. Uniacke Pizza comes through for us every time.